I'm home again from a short trip down to Salem, MA. Part mini-vacation, part book promo, it's safe to say that my trip down to Witch City was everything I'd hoped it would be. I love Salem, not only because every day is Halloween but because everyone is super friendly and very welcoming. and I tried fried green tomatoes (which were delicious)! We toured a few places, the cemetery, memorials and some of the museums. And then on Wednesday I set up a book table at Wicked Book Books where I got a chance to chat with a bunch of cool people throughout the course of an afternoon. Overall it was a really fun experience. I met a lot of people from all over the place and everyone was super friendly. Some folks took pictures with me, some wanted to chat about writing and life as an author. I met a lovely writer named Bonnie who invited me to join her at the New England Author's Expo and I met another writer named Michael who has a western comedy rolling around in his head. I had folks ask me some interesting questions as well, like Are you a witch? And, Do you believe in Astrology? For the most part, despite the fact that I was a tourist too, I felt like I really fit in and belonged there. I'm really glad it all came together and I was able to bring my books (and my kids) down there for a bit of fun. I am regretting not partaking in some of the other entertainment while there. I was right next to a psychic on book promo day but didn't get a chance to sneak over. There are many places to have your fortune read, whether by psychic, tarot, or runes, it seemed to be a pretty common service. All in all a great trip and a much needed mental break. I feel very inspired to get back to work and craft some new tales about magic and supernatural creatures. Rerelease day is quickly approaching. I'm having a special contest running for just my newsletter folks and there's still time to enter. If you haven't signed up for my newsletter, you really should. I'll be sending the next one out July 31 with contest details/reminders so CLICK HERE if you're interested. 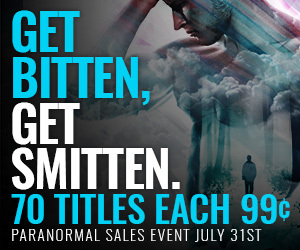 And just a reminder, all of my ebooks are on sale for the low, low price of .99 cents! Super great deal!